Unlike many of its historic neighbours, the town of Livingston did not even exist until 1962, when it was built as part of the post-World War II New Towns Act in a bid to ease the overcrowding in Glasgow. Since then, various industries have played a role in the town’s growth and development including shale oil and technology companies. In fact, at one point such companies were so prevalent in Livingston and the surrounding area, that is became known as ‘Silicon Glen’. Today Livingston has a thriving retail sector and boasts a huge modern leisure complex with over 150 stores, cafes and restaurants. If shopping isn’t quite adventurous enough for you, you can also have a go on the climbing walls and zip wires they have on site, treat the kids to a soft play birthday party, or attend one of the regular interactive events they host. For those who prefer more peaceful, rural pursuits, Livingston is also home to the Almond Valley Heritage Trust, where nature-lovers can enjoy endless woodland walks, a visit to the petting zoo or even an off-road tour of the local area on a tractor. The Hog Roast Livingston team feels very in tune with the town’s modern outlook when it comes to the catering service we provide. Whilst we still employ traditional cooking methods, we do so using our own specially-designed cutting-edge equipment and we offer a wide variety of exciting new menus with something for everyone. Whether you are organising a corporate event at the Livingston Centre or you are planning a tree-lined wedding reception in the open air at Almond Valley, Hog Roast Livingston’s event planners will work closely with you to ensure your menu and the style of service you require are both absolutely spot on for your big day. We don’t just provide the hog roast, we take care of everything else as well and we can provide complete 3 course meals with canapes, vegetarian options and different styles of food to fit with the theme of your event. 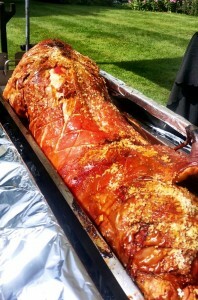 We aren’t just known in the Livingston area for our superb hog roasts, we are known for being an extremely well-rounded and adaptable catering company who can cook in any location for any type of event.